News 12's Lenneia Batiste explores a fitness class at Ailey Extension that teaches all the latest Indian dances while helping people burn calories. 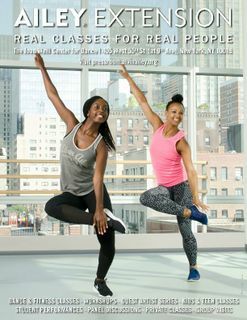 ABC’s The View featured a Masala Bhangra fitness segment with Ailey Extension instructor Sarina Jain and students. In a brightly lit studio tucked inside New York City's renowned Alvin Ailey dnace center, dozens of women and men sashay from one corner of the room to another to the beat of Bollywood rhythems, throwing their heads back dramatically. Attending Indian weddings and ending up the night sweaty and tired from hours of bhangra dancing have been regular parts of my weekend repertory since I was a child. The catchy music can entice even the most die-hard wallflower to move. I'd walked by the formidable Alvin Ailey Dance Theater so many times before, always catching glimpses of beautiful dancers in tights and leotards, plieing and twirling in unison. But tonight, I was going inside the building myself to take a Masala Bhangra class being taught by the famous Sarina Jain - the Jane Fonda of India. Even beginners and walk-ins will appreciate the flavor of this full-blown workout class. Creator Sarina Jain has a new routine for every session and says the dancing style is simple: "Pretend you're at an Indian wedding and get your groove on," she says. There is something undeniably brag-worthy about getting your workout at a dance studio rather than a gym. In the wake of Slumdog Millionaire's Oscar success, Indian dance is hotter than ever - and visionaries like Sarina Jain are fueling the fire. The News Feed - "Everyone Calls Me The Jane Fonda of India." Sarina Jain, the original creator of the Indian folk dance called Masala Bhangra, says that after an outstanding stretch of 10 years in the fitness instructing industry, her students call her the Jane Fonda of India.